Castlevania: Circle of the Moon, known simply as Castlevania in Europe and as Akumajō Dracula Circle of the Moon (悪魔城ドラキュラ Circle of the Moon Akumajō Dorakyura Sākuru obu za Mūn?, lit. "Devil's Castle Dracula Circle of the Moon") in Japan, is a video game created by Konami for the Nintendo Game Boy Advance system. 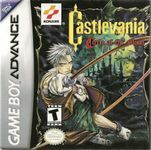 The game was released in 2001 and is the first Castlevania game for the Game Boy Advance. Despite the differences in local titles, the North American title has become the standard used to refer to this game.